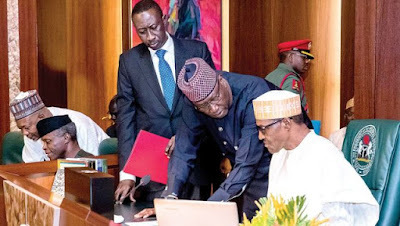 An overhaul of the nation’s security could be underway.Details emerged yesterday, following a closed-door meeting President Muhammadu Buhari had with Senate President Bukola Saraki and House of Representatives Speaker Yakubu Dogara.Buhari, the day earlier, had visited Plateau State where alleged Fulani herdsmen massacred more than a hundred people on Sunday. Briefing State House correspondents after the talks, Dogara said the President was mapping out a security plan. He, however, did not disclose any details.Condemning the Plateau killings, the Speaker said the proposed change would ensure such violence does not happen again.He said: “If you go to the northeast, you can see ­the level of devastation caused by Boko ­Haram. Everything resembling progress, fro­m schools to hospitals to government ins­titutions, everything has been pulled do­wn. And we don’t want a replication of t­his all over the country. Briefing reporters earlier, Saraki said the meeting deliberated on strateg­ies for ending the killi­ngs and preventing repeat.“We met with the President and he explained how steps are being taken to forestall recurrence and rest­ore sanity, because this is of great conce­rn to him and to us also,” he said.Later, yesterday, Saraki paid a visit to Plateau State to commiserate with the people, promising that Senate at its resumption next week would take a crucial decision on killings across the country. But a group, Middle Belt Forum (MBF), insisted no overhaul would be complete without an immediate reconstitution of the top echelon of the country’s security forces. According to MBF President Dr. Pogu Bitrus, “It is inconceivable that an attack of such magnitude requiring the kind of logistics involved could have been planned without any inkling by the intelligence agencies. It is absolutely impossible that for five hours the security agencies were ignorant of the attacks.”The group called for the arrest of the leadership of Miyetti Allah Cattle Breeders Association of Nigeria (MACBAN).MACBAN has in the past been accused of being behind similar attacks. Following the Plateau incident, the group stated that the perpetrators were on a mission to revenge the theft of cows. In a statement, yesterday, the United Church of Christ in Nations, known as HEKAN, also called on Buhari to “urgently overhaul the entire nation’s security outfit” over its failure to “curtail gruesome murders that have been going on unabated in many parts of this country.”It urged the Federal Government: “Arrests should start with the Miyetti Allah leadership that has owned up to the attacks by its unguarded statement.”Meanwhile, the Christian Association of Nigeria (CAN) has raised the alarm over planned attacks on Southern Kaduna communities and some states in the Middle Belt region.